This exercise has been completed on Nexus 7K titanium emulator. I am running two N7K titanium machines inside vmware workstation and have connected 7 network adapters to emulate the physical interfaces in N7K, i am using titanium emulator version 5.2.1, if you are curious to know about the N7K titanium emulator and how to install inside vmware workstation, i will be writing more stuffs on it, soon. 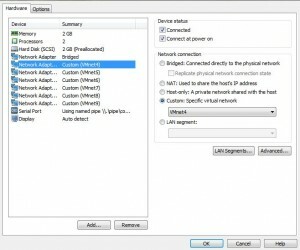 I have connected my network adapters as follows on both machines, we can check which physical Ethernet interface on N7K machine is connected to network interface card on vmware workstation by simply disconnecting and watching ” show interface brief” on N7K console which interface is going down. 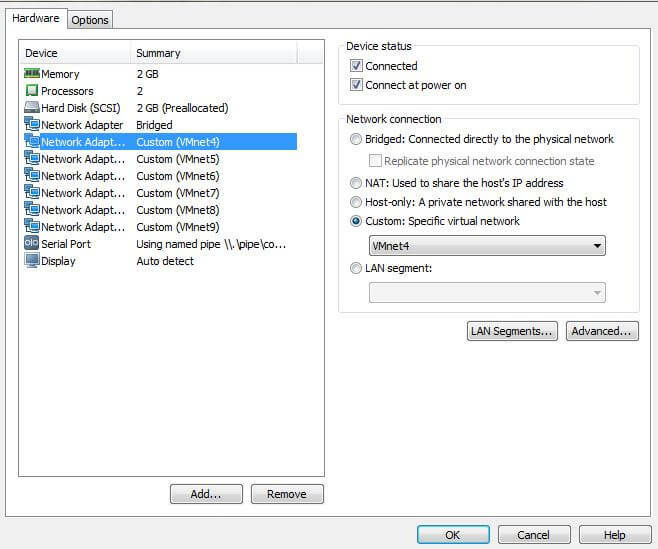 Right now my Ethernet2/1 on both N7K is connected to Vmnet4 on both vmware machines.We need to confirm and recheck else our virtual machines will not talk to each other, they should be on the same Vmnet. Lets start with our configuration. Step 1:- Lets change the hostname of the device and assign N7K-1 to one machine and assign N7K-2 to other machine, by our old IOS familiar command “hostname N7K-1″. N7K(config)# hostname N7K-1 –>Same for other machine as N7K-2. 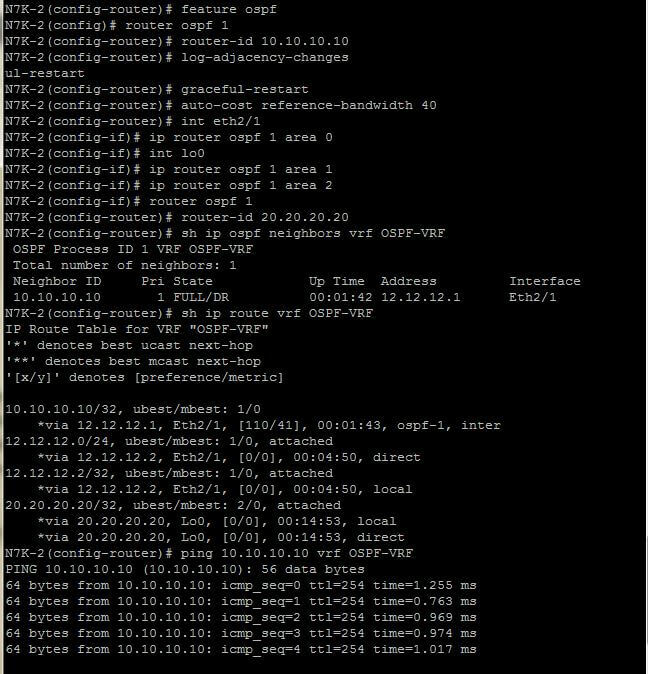 Step-2:- Assign ip address of N7K-1 Ethernet2/1 as 12.12.12.1/24 and unshut the interface, also assign ip address of N7K-2 Ethernet2/1 as 12.12.12.2/24 and unshut the interface.Verify connectivity by pinging across the interfaces. 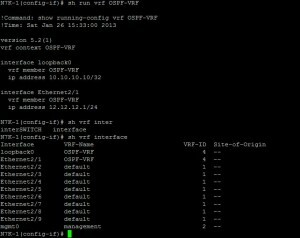 We can also verify with “sh run vrf OSPF-VRF” to check the interface vrf assignment. 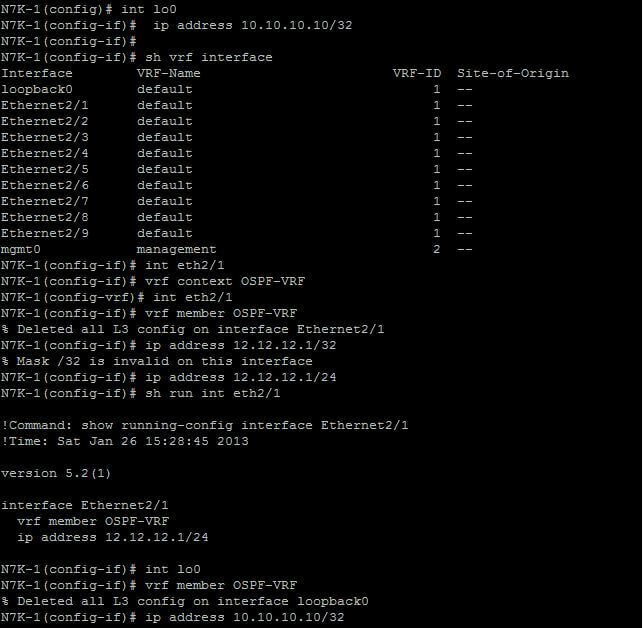 Step 4 Configure the same on N7K-2 with the loopback0 address of 20.20.20.2/32 and vrf as OSPF-VRF and assign it to interface eth2/1 and loopback0. 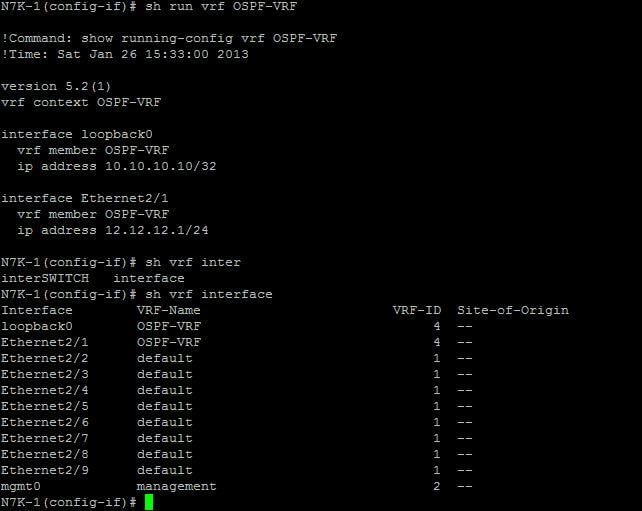 Step 5 Next we start our OSPF configuration , this Lab is completed under vrf just to show the vrf functionality along with OSPF, we can also run OSPF without vrf instance in NXOS like we do in IOS. 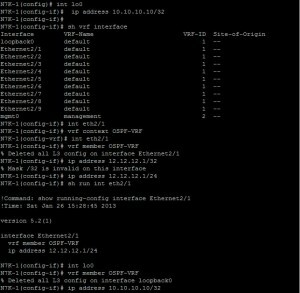 First we enable the “feature ospf” and configure some basic OSPF commands and assign Area 0 to interface Eth2/1 on both N7K and assign Area 1 and Area 2 to both Loopback0. 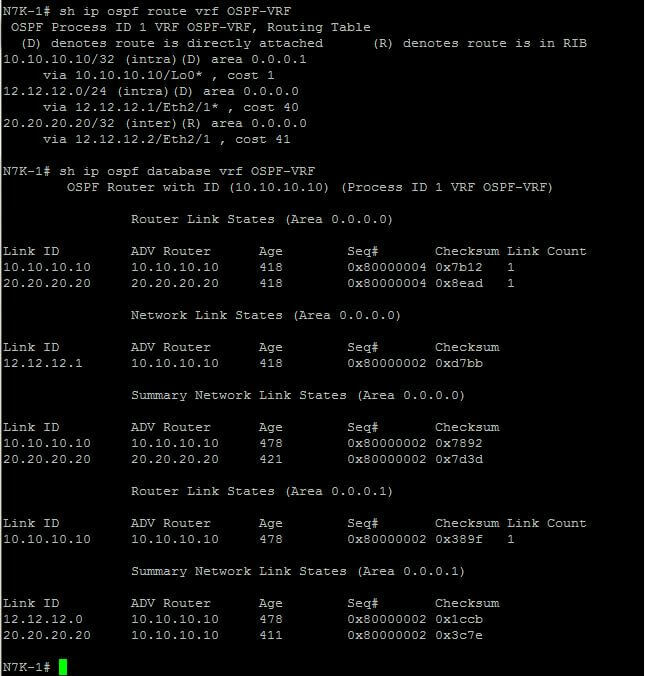 And in the end we will verify our OSPF neighborship and routes received. 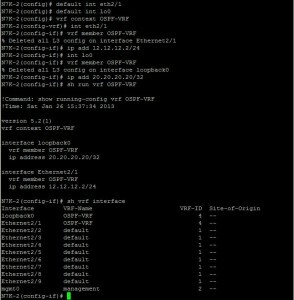 Step 6 :- We will verify our configuration with various show commands. And play around with OSPF. 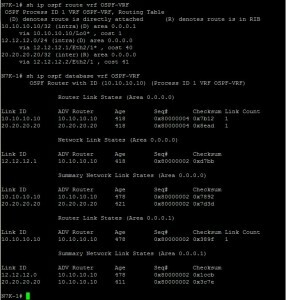 We can also clear ospf process by “clear ip ospf neighbor 20.20.20.20 vrf OSPF-VRF” and by command”restart ospf 1″ . 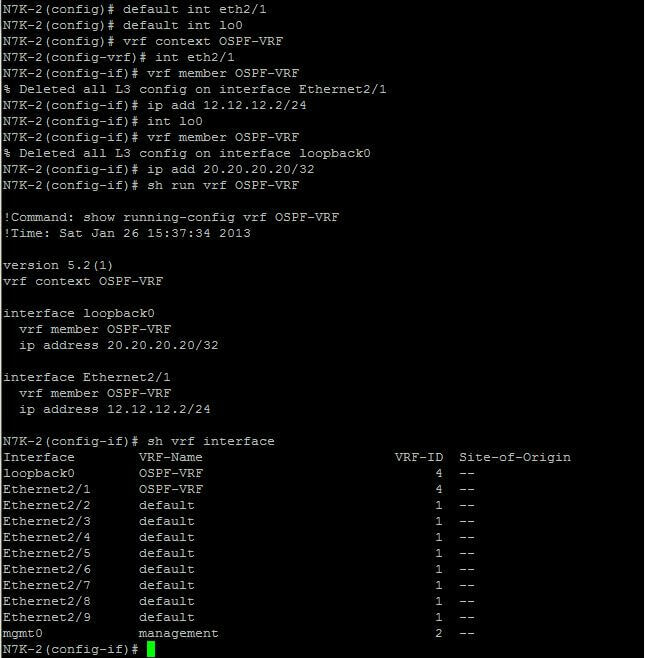 And watch hellos send and received and other ospf traffic related parameters by “sh ip ospf traffic vrf OSPF-VRF”. We can also configure OSPF authentication in NXOS same as IOS.